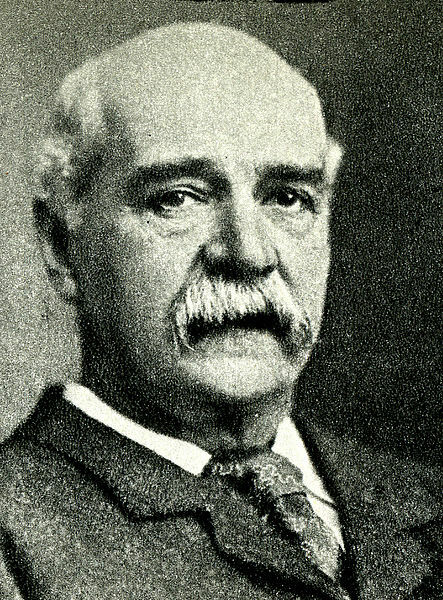 Sir William de Wiveleslie Abney was born on July 24, 1843 in Derby, England. His father, Rev. Edward Abney, was vicar of St. Alkmund's in Derby. Abney attended Rossall School and the Royal Military Academy in Woolrich and joined the Royal Engineers at 18, after which he served in India for several years. From his father he inherited a interest in photography and he attended the Military School of Engineering in Chatham in order to learn about it. There he was put in charge of a photography laboratory and he was promoted to captain in 1873. He became and instructor at Chatham in 1874. While at Chatham Abney participated in the photographic observation of the transit of Venus in 1874 and developed film for infrared photography. Using this film he was able to take a picture of a boiling kettle of water in a completely dark room. He also used it to study the infrared spectrum of stars and developed infrared photography to be used to study the infra red spectrum of organic chemicals. Infrared light is electromagnetic radiation that has a longer wavelength than visible red light (which is at the long wavelength end of the visible spectrum). It is emitted by hot objects near room temperature. Infrared light is absorbed and emitted by organic molecules as they change their rotational and vibrational states and based on the wavelengths of these absorptions it can be used to identify various compounds. Abney wrote many books on photography which were the standard texts of the day. He was a member of the Royal Astronomical Society once serving as president and was a member of the Physical Society of London, where he also served as president. He was a member of the Royal Society and was knighted in 1900. He died on December 3, 1920. It is pronounced just as it is written. Think of it as a compound word, "wive" "leslie"